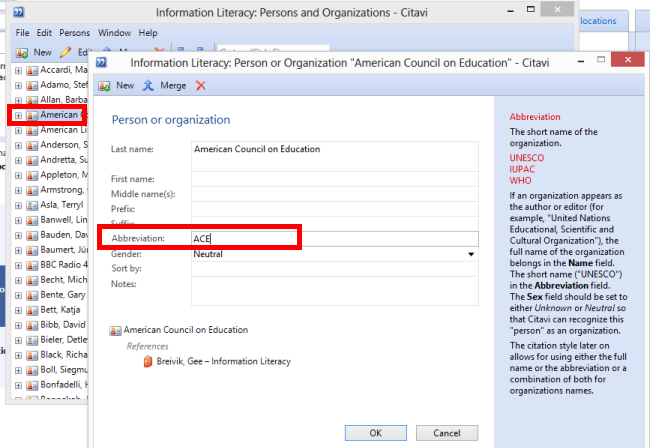 I use in text-citations in word through Citavi's add-in. For official/government documents (most of which are Internet Documents), I would like the in-text citation to appear as short as possible. How can I format the citavi reference to only show the country and the year (e.g: Brazil 2012)? For example, if the complete author is: "Brazil. Ministry of Health and Social Development" and the year is 2012, I would only like "Brazil 2012" to appear in the text. Is that possible? If so, how should I format the "author" cell in Citavi? Thanks for your question! In order to do this, you would need to enter the country name in the Abbreviation field under Lists > Persons and organizations. Also, please make sure that the full name of the organization is in the Organization field, and not the Author field. In the citation style you're using, the Author component in the In-text citation rule set will need to be changed so that abbreviations are displayed rather than full names of organizations. If you let us know which style you are using, we'd be happy to make this adjustment for you! I am using Chicago 16th ed. (author-date). Thanks for your reply! You can download the style below. Please save it to the folder Citavi 4/Custom Citation Styles. I have downloaded and saved the file. But it does not seem to default to the abbreviated format automatically. Is there anything I have to do to make this happen? If the abbreviation is still not appearing after that, please let us know! I have entered the abbreviation for those citations. In fact, the citation now reads : Brasil. Secretaria Nacional de Renda de Cidadanía (Brasil) (2012). The country in brackets (Brasil) is the addition after I added the abbreviation.